"I want to say how proud I am that you want to make a sketch of me. You are the only painter we have, perhaps the only one we ever had, whose work has its ghosts behind it ..."
"The painting is far more important than the sitter. This painting will still be carrying my identity when my own work is forgotten." 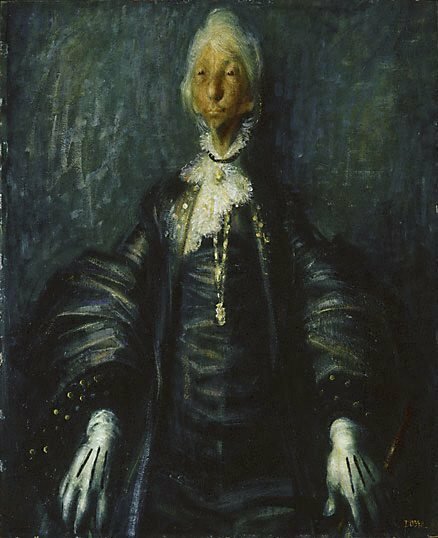 Dame Mary Gilmore (1865-1962) was a distinguished humanitarian, poet, left-wing political activist and social reformer, who became part of a network of writers and artists, including Dobell, who lived in Kings Cross, Sydney following the war. This portrait, typically developed through many sketches and studies, is perhaps the most profound of his many commissioned portraits during the last years of his life. This work was a finalist in the 1957 Archibald Prize and was acquired by the Gallery in 1960. Signed l.r. corner, orange oil "DOBELL". Not dated.